Thanks to everyone who made OpenNebula 2.0 possible! As you know, OpenNebula 2.0 is out the door, and we’re delighted with the response from our community. Besides the huge spike in downloads, we have received many congratulations over email and Twitter from many of our users, specially those who are deploying OpenNebula in very large infrastructures. However, we would like to take a moment to acknowledge that, if OpenNebula 2.0 has gotten so far, it is in no small measure due to the many users and organizations in our community who have actively contributed to OpenNebula. Sander Klous, Sebastien Goasguen, Ulrich Schwickerath, Jeroen Nijhof, Tiago Batista, Nils Dijk, Marlon Nerling, Alexandre Joseph, Ariel Garcia, Carsten Friedrich, Charles Loomis, Chris Usher, Claude Noshpitz, Damien Raude-Morvan, Enrique Alvarez, Florian Kruse, Frank Stutz, Gyula Csom, Jason Heiss, Johan Tordsson, John Dewey, Lakshan Perera, Marc-Elian Begin, Martin Kopta, Matt Lavin, Michael Coram, Neil M, Nuno Cardoso, Patrick Naubert, Petri Lammi, Rahul Chandra, Rangababu Chakravarthula, Shi Jin, Stefan Freitag, Tres Wong-Godfrey, Waheed Iqbal, and others who might have slipped through the cracks. An latest list can always be found in the OpenNebula development site. The extensible and open architecture of OpenNebula has enabled various contributors to develop substantial pieces of software that, while not strictly a part of OpenNebula, can be used in combination with OpenNebula to provide additional functionality. This thriving ecosystem includes projects such as schedulers, additional drivers, and tools that enhance the OpenNebula user experience. The following organizations have contributed to our ecosystem: CloudScaling, Telefonica I+D, C12G Labs, SARA Supercomputing Center, University of Chicago, Clemson University, and CRS4 Computing Center. OpenNebula is the result of many years of research and the interaction with world leading industrial and academic organizations in cloud computing. OpenNebula is being enhanced in the context of several flagship international projects in cloud computing to address the requirements of business and research use cases from leading IT organizations across multiple industries. We would like to especially acknowledge these pioneering projects and their partners for their invaluable contributions. RESERVOIR, main contributor with significant impact on OpenNebula’s design and innovative features, coordinated by IBM and with the participation of Telefonica I+D, University College of London, Umeå University, SAP AG, Thales Services SAS, Sun Microsystems Germany, ElsagDatamat S.p.A, DSA-Reasearch at UCM, CETIC, Universita Della Svizzera italiana, Universita degli Studio di Messina and the European Chapter of the Open Grid Forum. StratusLab, coordinated by Centre National de la Recherche Scientifique and with the participation of DSA-Reasearch at UCM, Greek Research and Technology Network S.A., SixSq Sárl, Telefonica I+D and Trinity College Dublin. BonFIRE coordinated by Atos Origin and with the participation of University of Edinburgh, SAP AG, Universitaet Stuttgart, FRAUNHOFER, Interdisciplinary Institute for Broadband Technology, DSA-Reasearch at UCM, Fundacio Privada I2CAT, Hewlett-Packard Limited, The 451 Group Limited, Technische Universitaet Berlin, IT-Innovation, and Institut National de Recherche en Informatique et en Automatique. 4CaaSt coordinated by Telefónica I+D and with the participation of UPM, 2nd Quadrant Limited, BonitaSoft, Bull SAS, Ericsson GMBH, FlexiScale, France Telecom, Universitat St Gallen, ICCS/NTUA, Nokia Siemens Networks, SAP AG, Telecom Italia, DSA-Reasearch at UCM, Universitaet Stuutgart, UvT-EISS, and ZIB. From all of us at OpenNebula: Thank you! https://opennebula.org/wp-content/uploads/2018/11/opennebula_cloud_logo_white_bg-4.png 0 0 Borja Sotomayor https://opennebula.org/wp-content/uploads/2018/11/opennebula_cloud_logo_white_bg-4.png Borja Sotomayor2010-10-29 15:18:142010-10-29 15:18:14Thanks to everyone who made OpenNebula 2.0 possible! At OGF30, after OpenNebula’s keynote, Dr. Daniel A. Reed, Corporate Vice President Extreme Computing Group & Technology Strategy and Policy at Microsoft, gave an excellent keynote speech about cloud and the future of research. 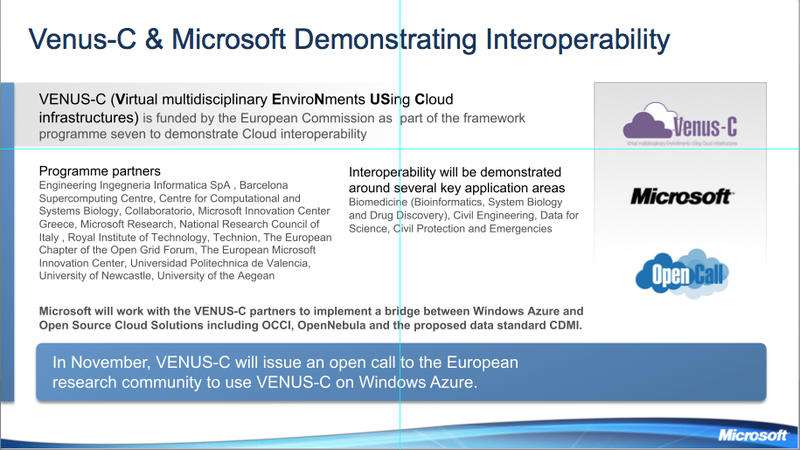 Dr. Reed also presented the new EU-funded VENUS-C project, coordinated by Engineering and aimed at developing, testing and deploying an industry-quality Cloud Computing service for Europe. Microsoft announced that it will work with VENUS-C partners to implement a bridge between Windows Azure and OpenNebula. We are very happy to announce this collaboration that will extend the current level of interoperability and portability provided by OpenNebula. Announcing the release of OpenNebula 2.0! The OpenNebula team is very proud to announce the release of a new stable version of the OpenNebula Toolkit! That’s right, OpenNebula 2.0 is now available for download. OpenNebula 2.0 marks the end of a large and laborious release cycle and an important milestone for the project in terms of functionality, maturity and community engagement. Apart from improved scalability and robustness and many exciting new features, we have also opened the project QA & testing procedures and created a new add-on section for high-quality, third-party open-source components. Scalability Improvements. Several components of OpenNebula have been tuned to work with tens of thousands of VMs, including the redesign of the scheduler and adjustments to the monitoring modules. Separate VM and Information actions. The specific operations performed when monitoring a host or performing an specific operation on a VM has been decoupled from the driver code base. Now it is even easier to tune your cloud. The number of connections to the node have also been reduced. Virtual Networking Improvements. OpenNebula 2.0 lets you define generic attributes associated to a Virtual Network (e.g. gateway, dns servers…) that can then be included in the context of a VM. This will let you easily configure VMs with multiple NICs. Additionally Virtual Networks can now be defined as public, and thus shared among multiple users. The complete source tree for OpenNebula can be freely downloaded here. The compilation has been tested on the main linux distributions, please check the platform notes for more information. Also binary packages for Ubuntu 10.04, CentOS 5.5, Debian 5.0.6 and RHEL 5.5 are available for download. We will appreciate any feedback you have after trying the new version, and don’t forget you can report your bugs either at the development portal or through our mailing list. For a detailed list of bugs addressed by OpenNebula 2.0 check the development portal. OpenNebula 2.0 is targeted at production environments and 1.4 installations are recommended to update. However, take into account that, starting with OpenNebula 2.0 Beta, a new DB schema was introduced. Thus, this new release will break compatibility with OpenNebula 1.4 (at the DB and API levels). Host, Networks or Virtual Machines defined in OpenNebula 1.4 installs will not longer work with this release, and must be recreated in the new system (we are working to make this process more seamless in future releases). OpenNebula 2.0 also includes new API calls and methods. However there have been no changes in those API calls already supported in OpenNebula 1.4. Applications using OCA (Ruby and Java bindings) are expected to work with OpenNebula 2.0. Finally, we would like to thank all the people and organizations that have contributed to make OpenNebula the most flexible, scalable and feature rich Cloud Toolkit! https://opennebula.org/wp-content/uploads/2018/11/opennebula_cloud_logo_white_bg-4.png 0 0 Borja Sotomayor https://opennebula.org/wp-content/uploads/2018/11/opennebula_cloud_logo_white_bg-4.png Borja Sotomayor2010-10-24 23:03:392010-10-24 23:29:42Announcing the release of OpenNebula 2.0! How big will OpenNebula 2.0 be? Of course, lines of code are a notoriously imprecise metric, so take the above with a healthy dose of salt. Plus, the above doesn’t account for the additional effort we’ve put into quality assurance, preparing documentation, helping users on IRC and on the mailing list, etc. In any case, we’re really happy with the 2.0 release cycle, and specially with all the great contributions and feedback we’ve gotten from our community. Looking at the above graph, we’re also amazed at how far OpenNebula has come, from a small technology preview that we initially just ran on a small cluster to a stable and well-tested piece of software capable of wrangling tens of thousands of virtual machines. Another interesting fact about the OpenNebula source code is the number of programming languages and technologies used: C++/C (63.02%), Ruby (21.89%), Java (6.19%), Shell Script (5.79%), Lex & Yacc (2.13%). So stay tuned… before you know it, you’ll be getting a release announcement from us! https://opennebula.org/wp-content/uploads/2018/11/opennebula_cloud_logo_white_bg-4.png 0 0 Borja Sotomayor https://opennebula.org/wp-content/uploads/2018/11/opennebula_cloud_logo_white_bg-4.png Borja Sotomayor2010-10-21 22:21:062010-10-23 00:40:54How big will OpenNebula 2.0 be? New OpenNebula QA & hudson.opennebula.org site! Last months have been quite busy for the team, a bunch of new features has been added to OpenNebula core as well exciting new components. There has been however a huge amount of effort that may go unnoticed in the upcoming OpenNebula 2.0 release. As part of this release we also wanted to open our internal QA & testing procedures to the community… so OpenNebula QA was born! ﻿Testing & QA of a cloud management tool is particularly challenging as it requires to verify the integration of multiple software components, from different hypervisors (Xen, VMware & KVM) and storage architectures (SSH, NFS) to operating systems (Ubuntu and CentOS) and DB backends (MySQL and sqlite). Just check the ﻿﻿OpenNebula QA page for a description of the automated test suite we are using, or if you want to check how your favorite Cloud toolkit behaves go to hudson.opennebula.org! https://opennebula.org/wp-content/uploads/2018/11/opennebula_cloud_logo_white_bg-4.png 0 0 Ruben S. Montero https://opennebula.org/wp-content/uploads/2018/11/opennebula_cloud_logo_white_bg-4.png Ruben S. Montero2010-10-15 14:12:252010-10-15 15:23:16New OpenNebula QA & hudson.opennebula.org site! Our sections Why OpenNebula? and Features elaborate on these reasons, and of course you always have our user mailing list if you have questions. The OpenNebula Project is participating in many upcoming events in cloud computing. These are the first contributions to OpenNebula Addons that are available in the Addon Catalog. The OpenNebula Project endorses these extensions and supports them through the user mailing list. Moreover, the project ensures its full compatibility with current and upcoming releases of OpenNebula. This news confirms OpenNebula as fully open source cloud software, not being a feature or performance limited edition of an Enterprise version. OpenNebula Enterprise brings additional benefits of long term professional, integration and certification support services, and regular updates and upgrades. The OpenNebula Project is happy to announce OpenNebula Addons, a new way to contribute to OpenNebula!. An OpenNebula Addon is an open source, production-ready software extension designed to extend the functionality of OpenNebula, but can not be included in OpenNebula distributions because of license conflicts. OpenNebula is released under Apache 2.0 license. The OpenNebula project does endorse these extensions and supports them through the user mailing list. Moreover, the project ensures its full compatibility with current and upcoming releases of OpenNebula. This will allow us to offer new state-of-the-art functionality from companies and organizations that for any reason can not release the software under the Apache license. Participation in OpenNebula Addons requires the contributors to allocate resources to maintain, improve and support the Addon. In few hours we are announcing the first contributions to OpenNebula Addons, we will keep you updated, so stay tuned! Michael Abdou on Translations needed – one last push for v.5.8 release! Jeovane on Translations needed – one last push for v.5.8 release! Alex on OpenNebula v.5.8 – Call for Translations! OpenNebulaConf 2019 – Call for Presentations! Maintenance release v.5.8.1 is available!